Unlike his birthday themes that he picks out 2 years in advance, Seth was super indecisive about his valentines this year. He really wanted to give out little tubes of bubbles, but he kept changing his mind on how exactly these bubbles were going to be presented. Two days before Valentine’s Day and he’s describing to me his Plan A, Plan B, Plan C… When he got to Plan D I cut him off. He really wanted to do something similar to last year. But we made one up and it just wasn’t working due to the thickness of the tubes. The rest of his plans were similarly complex with unresolved issues and we were getting down to the wire. So I started to do a little brainstorming and came up with this tag. 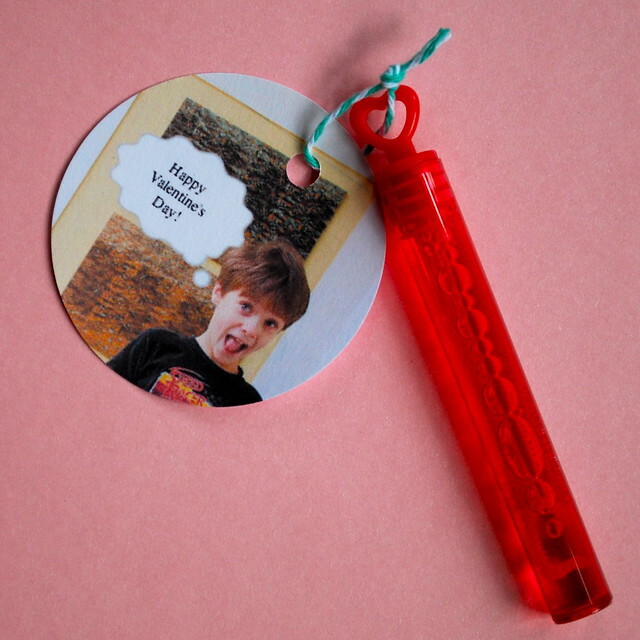 It actually contains elements from many of his ideas – photo of him, bubbles, a tag. The only plan it didn’t accommodate was one involving little rockets with the bubbles tucked inside. I’m not THAT crazy. Well… maybe I am, but we didn’t have enough time for crazy. I took a photo already out on flickr, popped it into Speechable to add the silly little speech bubble, used the handy tools for sizing and printing already on iphoto and boom I had a pic ready to make into tags. Super speedy I tell ya. 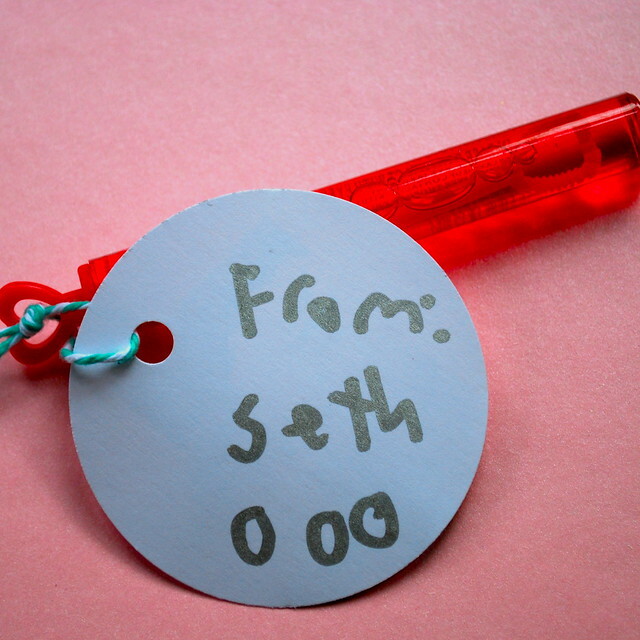 Using my great new circle punch (that had some how found it’s way into my christmas stocking not too long ago), Seth was able to punch them all out himself. It really helped that the punch is flat on both sides and fairly wide, so even though he’s only 7 he had enough strength to work this large punch upside down. He added his signature to the backside, including circles representing hugs but left off the ‘x’s so as not to give any wrong ideas.